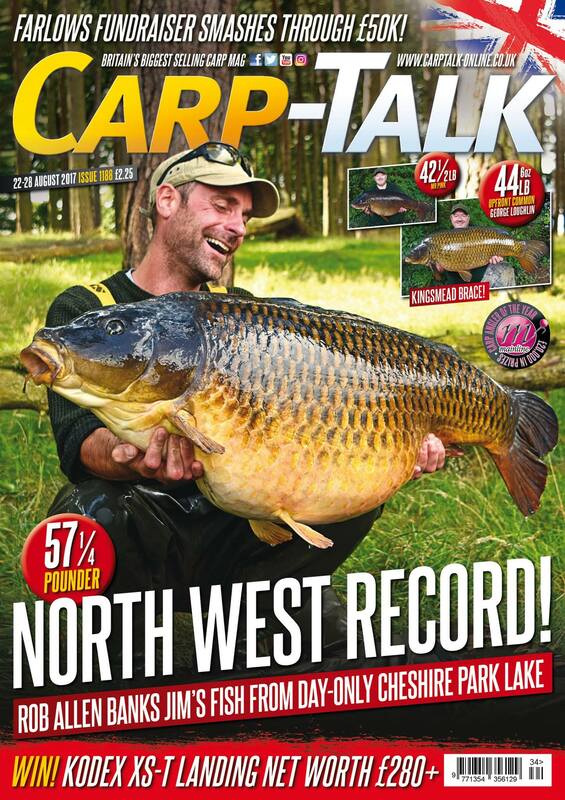 Carp-Talk 1188 is available to download now! 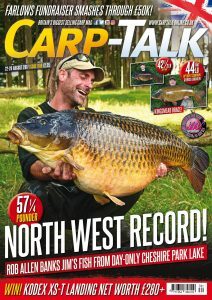 pocketmags.com/carp-talk-magazine#57595d02e03f4. There is only one place to start this week and that’s with Rob Allen’s capture of Jim’s Carp at 57¼lb from a famous Cheshire park lake. Also in the news, Old Mill’s Big Common has been out at its top weight, Horton Church Lake has continued its staggering form, and Kingsmead 1 has thrown up a couple of rare jewels. We also recap a record-breaking fundraising weekend at Farlows in aid of Wayne Mansford’s mum Jacqui. Marcus Howarth sets a new record on one of the country’s most historic waters, and James Armstrong appears in the Carp-Talk Q&A. Nicky Onslow finds himself preoccupied with one particular mirror carp, and Andy McFarlane reviews Kodex’s Robo Eazi-Carry Chair. Also, products from On the Beaten Track, RidgeMonkey, Fox, Spotted Fin and Sufix go under the spotlight. We announce the winners of the RidgeMonkey Juniors, and we’ve got three sets of Kodex XS-T 42-inch nets and Konnect handles to give away.